Joannes Est Nomen Ejus, Latin "John is his name". The coat of arms of Puerto Rico was first granted by the Spanish Crown in 1511, making it the oldest heraldic achievement still currently in use in the Americas. The territory was ceded by Spain to the United States in accordance to the peace treaty that ended the Spanish–American War in 1899, after which two interim arms were adopted briefly. A law was passed in 1905 that re-established the historical armorial bearings as the arms of the territory; after numerous investigations and amendments, the current version was adopted in 1976. 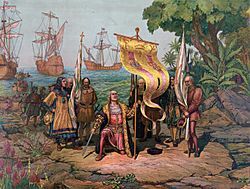 Christopher Columbus arriving in the New World carrying a banner with the initials of Ferdinand II and Isabella I. 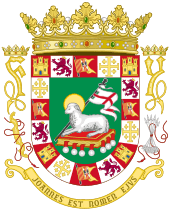 The major symbolism of the coat of arms relates to the dominance of Spain, the strong Roman Catholic influence in the region, and the integrity of Puerto Rico as a colony of Spain. There have been different variations of the coat of arms changing throughout Puerto Rico's history. The current version was officially re-adopted by the Commonwealth government of Puerto Rico on 3 June 1976. The green background represents the island's vegetation. The Lamb of God and cross flag on the shield are symbols traditionally associated with St. John the Baptist, patron of the island. The book with the seven seals on which the lamb sits represents symbolism from the Book of Revelation, generally attributed to St. John the Apostle. The border is made up of 16 different elements: castles and lions to represent the Kingdom of Castile and the Kingdom of León, a flag with the arms of the Crown of Castile and León, and The Cross of Jerusalem to stand for the Kingdom of Jerusalem, whose succession rights passed to the Kingdom of Sicily, and henceforth to the Spanish Crown. The gold-crowned F and the arrows (Spanish: flechas) represent Ferdinand II of Aragon, while the Y and the yoke (Spanish: yugo) represent Ysabel, i.e., Isabella I of Castile who were the Catholic monarchs when Puerto Rico was discovered. 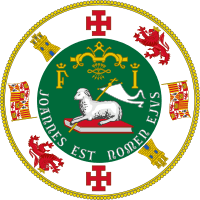 The Latin motto, "JOANNES EST NOMEN EJUS" (a quotation from the Vulgate of Luke 1:63), means "John is his name", referring to St. John the Baptist or San Juan Bautista, the original name of the island. All of the states and territories of the United States employ a seal to authenticate and ratify documents and accordingly a seal of Puerto Rico exists, but the traditional coat of arms is used as the main emblem of the commonwealth. The seal has most of the elements of the coat of arms, but the religious elements have been stripped away in accordance with the Separation of church and state in the United States. In the seal, the lamb, which no longer has a halo, carries a white banner instead of one with a red cross. The lamb's staff does not have the cross mounted on top. The book the lamb sits on does not have the seals of the Book of Revelation. The first Governors used the seal as their emblem but in recent years the usage of the seal has been limited to being the official emblem used to represent Puerto Rico on its legal documents when they are sealed. The Seal of the Governor is the official symbol of the executive head of Puerto Rico. It follows the design used by the Seal of the President of the United States. There are several variants of the Governor's Seal in use. Coat of arms of Puerto Rico Facts for Kids. Kiddle Encyclopedia.